Video is now a ‘must have’ in Higher Education – but what are the implications for accessibility? The article was based on a survey which received 550 responses. The respondents were drawn from IT, digital media, instructional design, senior administration and faculty departments of K12 and HE worldwide who completed an online surveyed between January and March 2014. 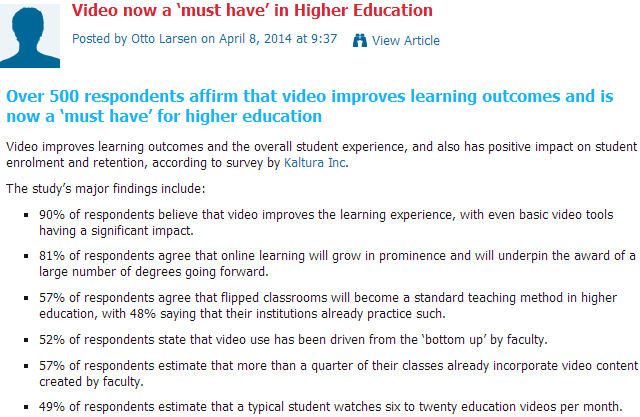 Is seems that this is broad agreement that “video has a significantly positive impact on all aspects of the student lifecycle, from attracting and retaining students to enhancing learning, boosting learning outcomes and building stronger alumni relations“. Note that the full report can be downloaded after completing a registration form. It should be noted that the report has been published by a company called Kaltura which describes itself as “The leading video platform: video solutions, software and services for video publishing, management, syndication and monetization“. A cynic might suggest that the company has a vested interest in commissioning a survey which show significant interest in use of video in higher education. I feel that the implications of the survey findings are worth considering but it would be helpful to have evidence of the popularity of video usage in the UK higher education sector. Back in October 2010 in a post entitled How is the UK HE Sector Using YouTube? I explained how “It can be useful for the higher education sector to be able to identify institutional adoption of new services at an early stage so that institutions across the sector are aware of trends and can develop plans to exploit new dissemination channels once the benefits have been demonstrated“. The post provided benchmark details on YouTube usage statistics for what appeared to be 15 official UK institutional YouTube channels which were easily identifiable at the time, together with details for the University of Bath and the Open University. A comparison of the usage statistics recorded in the initial survey with the current findings is given in Table 1. The survey carried out in October 2010 also provided statistics for additional UK University YouTube accounts which were found. A comparison with the current findings is given in Table 2. Note that the channel for Aston University from the initial survey no longer exists. In order to provide comparable statistics the data from the initial survey has been omitted. Also note that the data in the tables was collected on 7 October 2010 and 20 April 2014. The tables provide evidence of the, perhaps unsurprising, popularity of video usage in the UK higher education sector. It should be pointed out that this information is based solely on use of YouTube. Institutions are likely to make use of a number of other video delivery services (the University of Leeds, for example, has an official YouTube channel which has 246,989 views and 949 subscribers and also a Lutube video service which currently hosts 3,447 public videos, although no download statistics appear to be available). Based on the sample evidence it would appear that we can agree with the statement “Video is now a ‘must have’ in Higher Education“. This will have many implications for the sector including the question of what video management and delivery tools should be used. But in this post I wish to focus on the accessibility implications of greater use of video resources. In a recent webinar on ‘MOOCs and Inclusive Practice’ I gave a brief presentation on Accessibility, Inclusivity and MOOCs: What Can BS 8878 Offer?. But are policy statements such as (1) achievable in an environment in which significant use is made of video resources? Will all video resources used on institutional web sites be captioned? In light of the greater use of video resources, it would appear to be timely to revisit accessibility statements – it should be noted, for example, that according to the Internet Archive the policy statement shown above is unchanged since at least September 2009. But would a policy statement of the type shown in (2) be appropriate? Such statement do appear to be very vague. Are there not alternatives between these two extremes? In my presentation on Accessibility, Inclusivity and MOOCs: What Can BS 8878 Offer? (which is available on Slideshare and embedded below) I suggested that the sector should explore the relevance of BS 8878 Web Accessibility Code of Practice, a British Standard which provides a framework in which appropriate policies can be determined for use in the development and deployment of Web products. Due to the lack of time during the webinar it was not possible to discuss the details of how BS 8878 could be used in an elearning context. However at the Cetis 2014 conference on Building the Digital Institution I will be co-facilitating with Andy Heath a session which will address the challenge of Building an Accessible Digital Institution. In this session we will “explore how the BS 8878 Web Accessibility Code of practice may address limitations of the WAI approach and see how BS 8878 may be applied in a learning context” and go on to “explore emerging emerging models of accessibility and developing architectures and technical standards“. Note that the early bird rate (£100 for the 2-day event) for the conference is available until 1 May. I hope that those who have an interest in accessibility for elearning, as well as in the broad range of learning issues which will be addressed at the conference, will consider attending the event. In the meantime I’d be interested to hear what your current policies and practices are for the accessibility of your elearning resources and, in particular, whether your practices reflect the policies. Feel free to leave a comment on this post. Note it was pointed out on Twitter that the figures for the Open University YouTube channel do not give an accurate representation of YouTube usage in the Open University. This may be the case; however the point of the post was to show trends in growth in YouTube over the past three years of so. I’m happy to include details of the most popular YouTube channel used by the Open University, ouLearn on YouTube, which has 18,782,934 views and 83,799 subscribers since it was launched in January 2008. One of the solutions to a more accessible experience for using YouTube in HE (and anywhere else for that matter) is provided by Henshaws College http://accessyoutube.org.uk/ AccessYouTube. It is keyboard accessible and easy to drive, which also makes it very useful to teach with; large clear text and none of the comment chaff so often contaminating YouTube content. This is also an example the HE can learn from other sectors, if it took the trouble to look more often. It’s interesting that you mention the benefits of a user agent (accessyouttube). Most institutional accessibility policies seem to cover only the content (which is covered by WCAG guidelines) and not the applications used to access the content. This is perhaps another example of the limitations of accessibility policies which don’t have a broader perspective. “Videos should always have captions or at least a transcript, to enable those who cannot see the video to access the information it contains. ” which begs the question what if you don’t have the resources to do this?